Get 5% off the price of the next ITF Seniors (over 35) tournament at the Rafa Nadal Academy by Movistar. It runs from Sunday 20th October (day of arrival) to Sunday 27th October 2019 (day of departure) and Local Tennis Leagues will be going! Also included is a group coaching session with the excellent coaches, social mix ins with other LTL players, an LTL goody bag and our famous quiz night! Players can also get together to arrange their own informal sessions between matches. The spa, gym, pool and fitness classes are outstanding and are free, and the price includes breakfast and dinner. You can hire a car and nip down to the coast or there taxis or very inexpensive buses to the beautiful city of Palma. Read about our last trip here. Mention Local Tennis Leagues when you book and you can get 5% off the price! To begin the booking process complete the form below. This will send an enquiry direct to the academy booking team who will be in touch to complete your booking. 2) add the promo code LTLITF5 and select "APPLY"
Don't forget to mention the LTLITF5 code to secure your 5% discount. 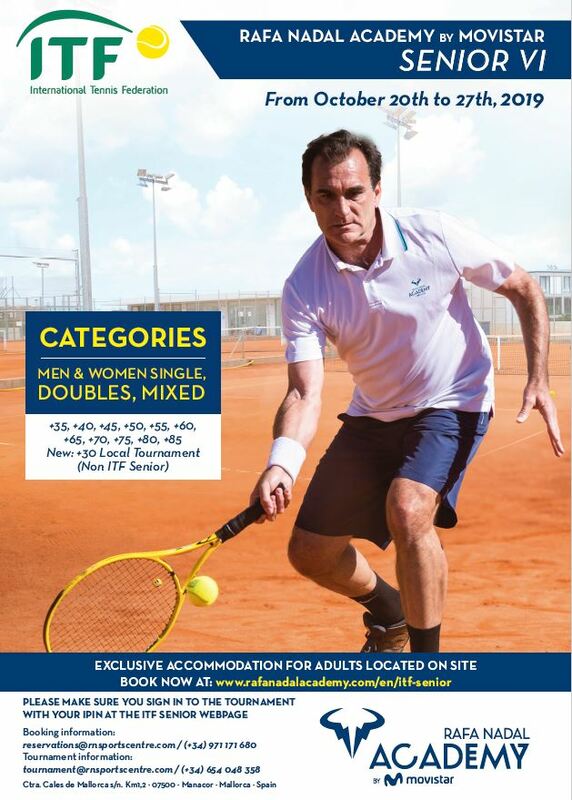 This event is an ITF Seniors Level 4 event for players over the age of 35. It is suitable for intermediate players and above. All players will need to have ITF IPIN membership (not included in the price). Flights are not included. The event is hosted by the Rafa Nadal Academy by Movistar and organised by the ITF. Bookings are made as individuals. Although members of the Local Tennis League team will be on site to welcome you, Local Tennis Leagues is not operating a package. Enter your passport number, if known. If you don't have it to hand right now you can still proceed but you will need this information when completing the booking with the Rafa Nadal Academy. If you don't have your guest's date of birth to hand now you can still proceed but you will need this information to complete the booking with the Rafa Nadal Academy. Please give us more details of your booking and the team will get back to you to discuss your needs. This form will automatically be sent to the booking team at the Rafa Nadal Academy. Please indicate your consent.